Is Your Team Able To Keep Up With The News? In the information age, you and your team are inundated with too much detail. Keeping up with market and industrial trends, what your clients or competitors are up to is time consuming if you have to Google each time. 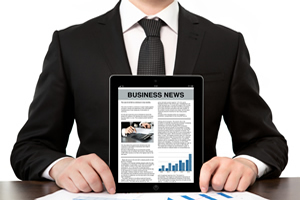 MNCs and several SMEs are turning to us to search, track and archive news on a daily basis. This info-on-the-go, delivered via the cloud or email allows an entire sales team to keep up with breaking news and important developments – at a fraction of the time each would have taken.